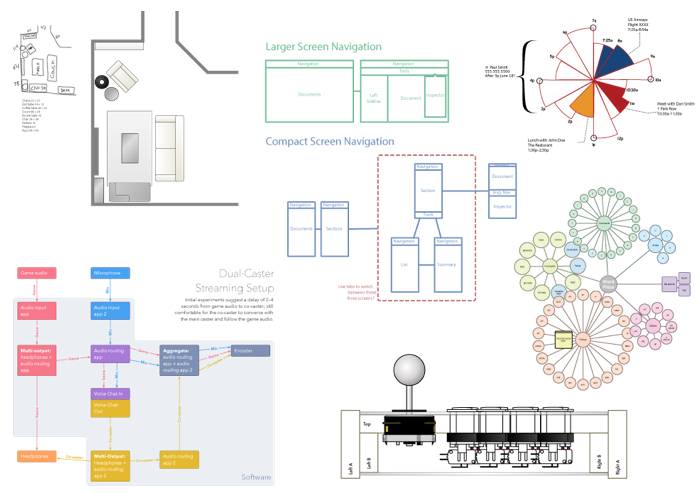 OmniGraffle [Standard version starts at $49 for iOS, $99 for Mac] OmniGraffle is for creating precise, beautiful graphics. Like website wireframes, an electrical system design, a family tree, or mapping out software classes. For artists, designers, casual data-mappers, and everyone in-between. Alto’s Adventure — Snowman App Sale [$1.99 → $0.99] Above the placid ivory snow lies a sleepy mountain village, brimming with the promise of adventure. Circles Memory Game — Snowman App Sale [$0.99 → Free] Circles is a wonderful new memory game for iPhone, iPod touch, iPad, and iPad mini. Checkmark 2 — Snowman App Sale [$4.99 → $1.99] Checkmark is back with an all-new design for iOS 8 and great new features, including Lists, Location Groups, One-tap Rescheduling, a Today widget, and much more! Shifts – Shift Worker Calendar — Snowman App Sale [$4.99 → Free] Shifts is the fastest and easiest way to enter and view your work shifts on iPhone. Apple – MacBook Pro with Retina display (Latest Model) – 13.3″ Display – 8GB Memory – 128GB Flash Storage – Silver [Best Buy; On sale for $1149.99, down from $1299.99] With fifth-generation Intel Core processors, the latest graphics, and faster flash storage, the incredibly advanced MacBook Pro with Retina display moves even further ahead in performance and battery life. RCA WP2UWR USB Wall Plate [Amazon; On sale for $10.99, down from $19.99]Turn any standard home AC power outlet into a USB charging outlet in seconds, with the RCA Original Wall Plate Charger. WD My Passport Ultra 1TB Portable External USB 3.0 Hard Drive – Red [Amazon; On sale for $54.99, down from $999.99] My Passport Ultra – Ultra-compact, local and cloud backup to go. Apple Lightning Connector Cable + Earpods w/ Remote & Mic [A4C; On sale for $14.95, down from $44.99] The Apple iPhone 5 Lightning to USB Cable is the perfect spare! In addition to the USB cable, this kit also includes the Apple Earpods featuring a redesigned remote, kickin’ bass tones, and a brand new, ultra-comfortable fit. SAMSUNG 32GB microSDHC Flash Card With USB 2.0 Reader [Newegg; On sale for $16.99 with coupon code EMCATNP55, down from $21.99] Save your precious memories—fast. This Ultra High Speed memory card is UHS-1 enabled, which means it captures photos and video two times faster than your typical microSD. Jump Out!™ [$0.99 → Free] Surrounded by cunning traps, they look ahead and see… the exit. These bugs have nothing to fear; they always look dangers in the face and keep on crying Jump Out! Cribbage HD [$3.99 → Free] Play the App Store’s top rated cribbage online with your friends or anyone in the world! Skill Game [$2.99 → Free] are clever? …are looking for a new challenge? …want to prove it to yourself? WHAT ARE YOU WAITING FOR? Death Call 2 [$0.99 → Free] There’s a new threat rising in the West; not made of flesh and blood, but steel. It must be stopped at any cost. Will you rise to the challenge? Mech Guardian [$1.99 → Free] It’s simple to play. The more monsters you hunt the higher score you’ll get. You have got to deal with all challenges while playing it by applying the game props properly. Please join our hero to protect this homeland. 7 Little Words for Kids [$2.99 → $0.99] Discover 7 colorful worlds as you solve the mini word puzzles. But don’t worry if you get stuck. You can always get a hint if you need it. It’s made just for kids, but many parents will love it too. Moxie 2 [$2.99 → $0.99] Moxie 2 is the FUN word transformation game…EASY to learn, but CHALLENGING to master. Hitman GO [$4.99 → $1.99] Hitman GO is an award-winning turn-based strategy game with beautifully rendered diorama-style set pieces. Slice Fractions [$3.99 → $0.99] Get your child excited about his or her next math discovery through this award-winning, problem solving game. We’ve teamed up with university education experts to craft an incredibly fun way to learn fractions. IMPOSSIBLE ROAD [$1.99 → $0.99] IMPOSSIBLE ROAD is a pure, minimal arcade game about risk, reward, and rollercoasters. Crow [$4.99 → $0.99] Crow is the critically acclaimed, story-driven action-adventure for iPad, iPhone and iPod Touch. Halftone 2 – Comic Book Creator [$1.99 → Free] Easily turn your photos into comic book pages and videos with Halftone 2. Apple’s App of the Week. Tabata! Daily 4-Minute Workouts [$1.99 → Free] Burn calories and get fit faster that ever! Lab Values Reference [$3.99 → Free] This app is perfect for both academic and clinical settings, providing clear, concise coverage of 375 of the most commonly performed laboratory tests. Deluxe Moon Pro – Moon Phases Calendar [$2.99 → $0.99] Deluxe Moon Pro is the best Moon app available in AppStore. Sleep Cycle alarm clock [$1.99 → $0.99] An intelligent alarm clock that analyzes your sleep and wakes you in the lightest sleep phase – the natural way to wake up feeling rested and relaxed. BillTracker for iPhone [$1.99 → $0.99] From the water bill to the car payment to the cell phone subscription, BillTracker for iPhone can help you stay on top of your bills. Perfect Weather – NOAA Radar, Forecast, and Severe Weather Alerts [$2.99 → $0.99] Some weather apps are overloaded with information. Others are designed to be pretty rather than useful. Perfect Weather strikes the right balance. It gives you a quick, clear overview of the conditions you care most about. Sago Mini Fairy Tales [$2.99 → $0.99] Make new friends, play dress up and unearth silly surprises. This open-ended play experience is perfect for toddlers and preschoolers. Blurred Wallpapers [$1.99 → Free] Custom Backgrounds and Wallpaper Images – FREE! Users can create a unique look for the Home or Lock Screen on their device in just a few clicks. Nearly – Smart Location Reminders [$1.99 → Free] Nearly is a simple way to create smart location reminders. Vintique [$0.99 → Free] Vintique provides awesome vintage filters and powerful image editing tools. Capo touch – Slow down and detect chords in your music [$9.99 → $4.99] With Chord Intelligence, beat detection, and other sophisticated technology that was once reserved for full-size computers, Capo touch brings the power of our award-winning Capo 3 to musicians on the move. Minuum – The Little Keyboard for Big Fingers: Now with Smart Emoji [$3.99 → $1.99] Type faster, see more screen, and take control of autocorrect with Minuum. Manual – Custom exposure camera [$1.99 → $0.99] Custom exposure for your iPhone camera. Pimp Your Screen – Custom HD Backgrounds and Desktop Wallpaper Images with Animated Clock Widgets [$3.99 → $0.99] Pimp Your Screen is here to customize the look of your desktop by giving you an exclusive selection of specially designed background images arranged in categories. MouseX [$0.99 → Free] Counts your mouse (or trackpad) traveling distance. You will be surprised how much you traveled! AnyConvert [$1.99 → Free] Convert various units easily with this app. It offers a total of 478 Units in 24 categories. RollerCoaster Tycoon 3 Platinum [$19.99 → $6.99] Build the ride of your life! RollerCoaster Tycoon® 3 Platinum combines the excitement of rollercoasters with the fun of a great strategy simulation. LIMBO [$9.99 → $4.99] Uncertain of his sister’s fate, a boy enters LIMBO.